There’s no surprise that in-ear monitoring systems have made a major impact in the way concerts are presented. Not only can performers hear themselves better than stage wedge mixes, but IEM use results in lowered stage volume. With a great IEM mix, the FOH engineer’s task becomes simpler, audience get better sound and artists are happy — a definite example of a win-win-win-situation. While custom–fit IEMs are the preferred choice, off-the-shelf universal-fit models are an ideal solution when guest artists show up unexpectedly, or artists leave their customs on a plane, hotel room/etc. And besides being less costly, universals are a great backup option in case the artist’s custom version gets run over by a forklift. 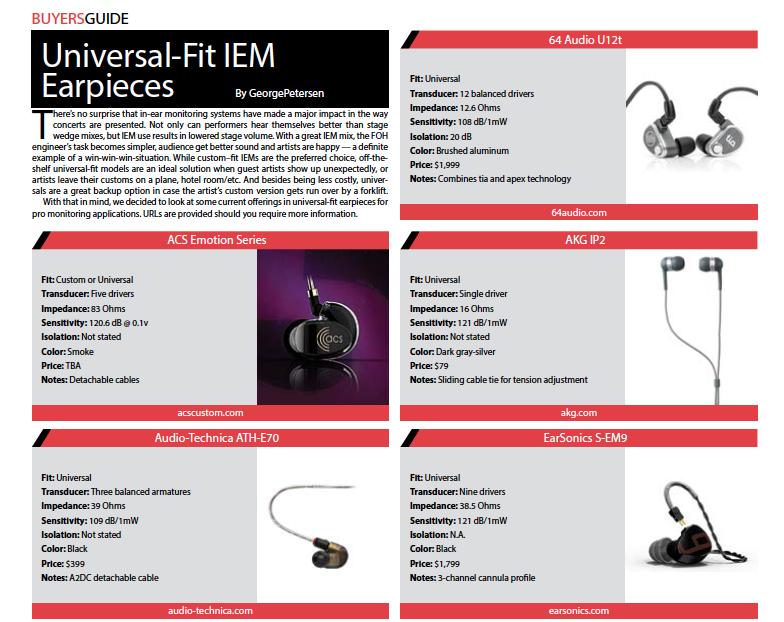 With that in mind, we decided to look at some current offerings in universal-fit earpieces for pro monitoring applications. URLs are provided should you require more information. To download a PDF of the Oct. 2018 FOH Buyers Guide, CLICK HERE.